Carved from sustainable bamboo and reclaimed teak, each has its own look, name, and lovable personality. 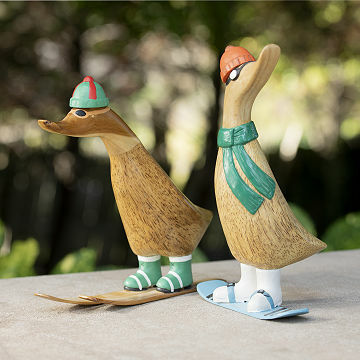 These daring ducklings have decided to trade migration for something a little more exciting: skiing and snowboarding! They're hand-carved from sustainable bamboo and reclaimed teak by artisans in Indonesia, and finished with hand-painted cap and boots. Since each one is made by hand, it has its own look, name, and lovable personality. The feathered friends will happily nest in the home of any avid skier or snowboarder, or give them a coat of varnish and let them wait out the summer outdoors, bringing charm to your garden or patio. Handmade in Indonesia. It is going to be a gift. Downhill Duck with Determination ! I bought this for my friend who is an avid skier. She loved it! The look on the ducks face shows determination and just makes you smile!! It has personality and is a conversation starter! This product was smaller than I thought, but that was my fault for not looking at the details! Regardless, I loved it. It's perfect for my mother, for christmas and winter decorations. Great quality, well put together. It is a gift and very cute! Buy one you will not be disappointed. My fault for not paying attention to the size. It's so small. Was suppose to be a gift for family but I can't just give this tiny thing. Disappointed. The whimsical character of this piece called out to me. This is the most well made, handcrafted item I've seen in a while. Exactly as pictured, well, actually better in person really. The wood is amazingly beautiful! And cute to boot with a little hangtag and packaged incredibly well. I had asked for a gift box as well, which is also very nice, high quality and came with a bow too. Highly recommend this item for anyone who skis, it is adorable and very cool.